Zhou Xun: News Updated on The Banquet! There were some old news about The Banquet - the latest film of Zhou Xun. 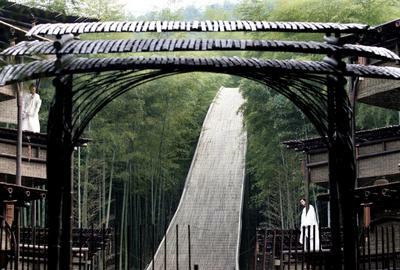 November 25th, 2005 - Pictures from the set of The Banquet, as constructed in the Anji bamboo forest near the city of Hangzhou in Zhejiang province. (Parts of Crouching Tiger, Hidden Dragon were also filmed in this forest.) In the story, the Crown Prince (Daniel Wu) leaves the royal palace after his father is killed by the new Emperor. He flees to this forest retreat to lead a life immersed in the arts, until he gathers the courage to seek revenge. Below is the set along with various characters in costume, including black knights, an artisan, and singers. At the end of the Tang dynasty warlords once again divide the country into feudal kingdoms, and proclaim themselves kings and emporers. The emporer of one of these kingdoms dies suddenly, and his brother (Ge You) ascends to the throne. Impiously he takes the widowed, beautiful young empress (Zhang Ziyi) for himself. Although by rites she is the stepmother of the dead emperor's son, the prince regent (Dainel Wu), the prince and her grew up together as children and would have married if she had not been selected as the empress. The prince is not an ambitious man, prefering instead the life of an artist, but he suspects that his uncle, the new emperor, may have had a hand in his father's death. The desire for revenge combined with the empress's wish for him to unseat his uncle and become emperor himself thrusts him on a dangerous road of rebellion and retribution. Unbeknownst to the prince and his uncle, a powerful court official has also long coveted the throne and the empress. He too schemes to become the emporer. 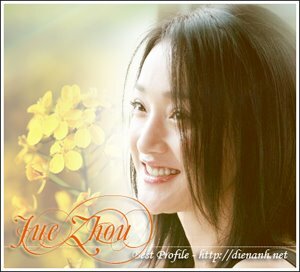 His daughter (Zhou Xun) however loves the prince, and seeks to help him against the wishes of her clan. The official's son (Huang Xiao Ming) has also been thrown into the chaotic struggle, to protect his naive sister and the honor of his family.